The Manzanar Committee announced on March 26 that former Manzanar incarceree and long-time community activist Wilbur Sato has been named as the recipient of the 2018 Sue Kunitomi Embrey Legacy Award. The award, named after the late chair of the Manzanar Committee who was one of the founders of the annual Manzanar Pilgrimage and was the driving force behind the creation of the Manzanar National Historic Site, will be presented at the 49th annual Manzanar Pilgrimage on Saturday, April 28, at the Manzanar National Historic Site, located on U.S. Highway 395 in California’s Owens Valley, between the towns of Lone Pine and Independence. Sato, 88, was raised on Terminal Island, a former fishing village that is now part of the Port of Los Angeles and the Port of Long Beach. While he was in seventh grade, Sato and his family were forcibly removed from their home and shortly thereafter incarcerated at Manzanar. Sato returned to the Los Angeles area after the war and dove right into community activism, joining the Nisei Progressives and later, the Japanese American Democratic Club. In 1947, Sato enrolled at UCLA. During his four years there, he founded the California Intercollegiate Nisei Organization (CINO), a statewide network of students who were involved in the Japanese American community. After graduating from UCLA in 1951, Sato became an attorney, and after joining the Japanese American Citizens League (JACL), he was named its civil rights chairman. He pushed the organization to get more deeply involved in political issues that affected the Japanese American community. In more recent years, Sato has been a long-time member of NCRR (originally known as the National Coalition for Redress/Reparations, and now as Nikkei for Civil Rights and Redress) and has had two stints as a member of the Manzanar Committee. Sato, who continues to be involved in the Democratic Party, has also worked to call attention to the little-known fact that 101 orphans were among those who were unjustly incarcerated at Manzanar, and he served as a docent at the Manzanar National Historic Site. 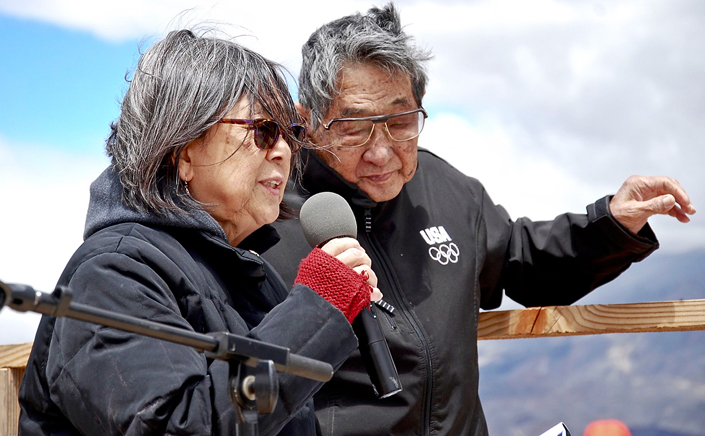 “Since the very early days after camp, Wilbur has been a constant presence and a strong advocate for redress and reparations and later, in supporting the Manzanar National Historic Site,” said Embrey. “His roots in the struggle go back to his days as a Manzanar incarceree, just like my mother [Sue Kunitomi Embrey]. His activism parallels hers in many ways. “Wilbur is one of the few lifers who, right out of camp, worked to gain recognition of what happened to Japanese Americans during World War II, to try to right the wrong. He did that in a lot of different ways and he’s been such a consistent, steadfast presence in so many areas. His persistence and presence in the United Teachers Los Angeles educational seminars that we would conduct with Los Angeles Unified School District teachers, or with the reunions for the former orphans of Children’s Village — he was always trying to make the community and the world better places, and that took guts. He had to endure periods when there was a very unfavorable political climate, but he persevered. UCLA Kyodo Taiko will open the pilgrimage at 11:30 a.m., while the main portion of the program begins at noon. In addition to the afternoon event, the Manzanar At Dusk program follows later that day, from 5 to 8 p.m., at the Lone Pine High School gymnasium, located at 538 S. Main St. (U.S. Highway 395), in Lone Pine, nine miles south of the Manzanar National Historic Site, across the street from McDonald’s. Through a panel discussion, small-group discussions and an open-mic session, Manzanar At Dusk participants will have the opportunity to learn about the experiences of those incarcerated in the camps. Participants will also be able to interact with former incarcerees to hear their personal stories, to share their own experiences, and discuss the relevance of the concentration camp experience to present-day events and issues. Pilgrimage participants are advised to bring their own lunch, drinks, and snacks, as there are no facilities to purchase food at the Manzanar National Historic Site (restaurants and fast food outlets are located in Lone Pine and Independence). Reservations for the Little Tokyo bus will be accepted on a first-come, first-served basis. The non-refundable fare is $40 per seat, $20 for students (proof of student status required). Complimentary fares are available for those who were incarcerated at any of the American concentration camps or other confinement sites during World War II.